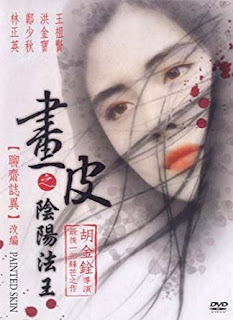 Tomorrow we are going to discuss Painted Skin (2008) on the Wuxia Weekend podcast. It is based on a Pu Songling story from Strange Tales from the Chinese Studio (you can find a public domain translation HERE, or you can read it in a more recent translation HERE--note: for those interested in the original material I highly recommend the Library of Chinese Classics volumes as well). This story and the movies had a very large influence on Wandering Heroes of Ogre Gate. It isn't wuxia, but like other tales from the Zhiguai-Chuanqi genre, like A Chinese Ghost Story, modern movie versions often feature very wuxi-like martial arts. Painted Skin (2008) is no exception. However it isn't the first, or last version. The original story is about a demon that can paint human skin as a disguise and wear it to appear like a beautiful young woman, an old lady, or, seemingly, anything else it wants. It seduces a scholar and tries to rip out his heart. I won't spoil the details but there is a taoist priest who tries to protect him, as well as his wife who makes a valiant effort to save her husband. It is quite short but packs in a lot of content. The 2008 version is probably the best known movie adaptation. Called Painted Skin, it stars Vicki Zhao, Donnie Yen, Chen Kun and Zhou Xun. It elaborates considerably on the story, and throws in some great action sequences. The 2008 version also saw a sequel, which took the story in a slightly different direction. The sequel is called Painted Skin: Resurrection, and I definitely think it is worth viewing as well. There is also a 1993 version directed by King Hu (the director of Come Drink with Me, A touch of Zen, Dragon Inn, and the Fate of Lee Khan). This was, I believe, his final film. 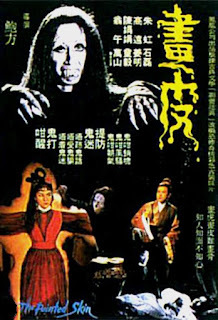 It is quite good in my opinion and has a classic horror feel (something you see in a lot of Kung Hu films, even ones like A Touch of Zen). It reminds me of the old silent horror films for some reason. The earliest version, to my knowledge, is the 1966 Painted Skin (this one is usually referred to as Hua Pi, but that just means Painted Skin). It isn't available in English that I have been able to find, but it is still worth watching to see the depiction of the painted demon. There are also television versions, like the 2011 Painted Skin and the Painted Skin episodes of the Strange Tales of Laio Zhai 2005 drama series. As a monster, in an RPG, these work really well. I've made creatures that are directly modeled on the idea (in Ogre Gate they are called Painted Maidens). But I also used the idea for the Glorious Death Cult, a martial sect whose members disfigure their bodies through burning so they can then paint new faces at will. The hardest part of running these kinds of monsters is knowing when players should be able to see through the disguise. I think there isn't one right way here, but my preferred approach is to disallow passive "Detect" or "Perception" rolls, and only allow a chance to notice the disguise if players actively say they are doing so. Generally speaking, unless it would be obvious, I am not a huge fan of passive perception rolls. I do allow them, but I like when players engage the setting directly and I think passive rolls tend to discourage that because it is assumed their characters will just notice things. At the very least, I would advise assigning a penalty to a passive roll. There is a world of difference between catching a spider from the corner of your eye because you just happened to notice, and finding one under the couch because you were actively looking. I think the same logic should apply here.